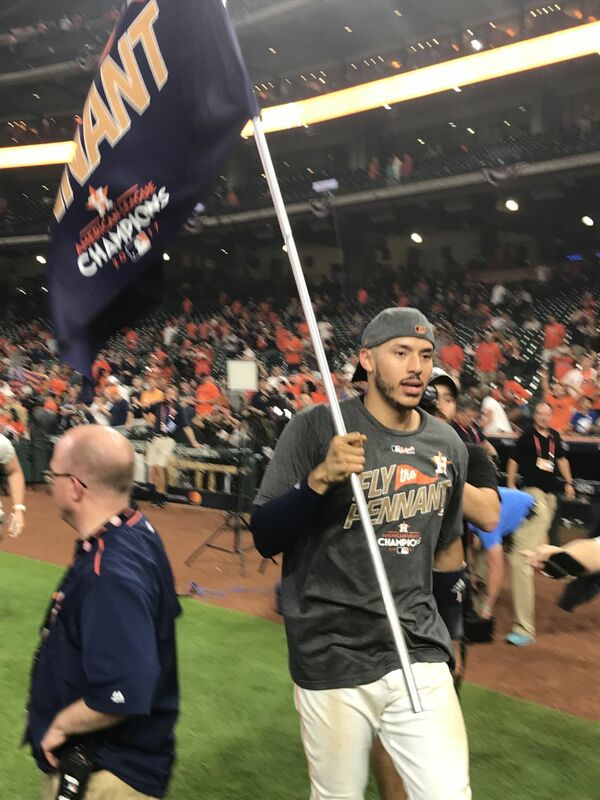 Astros shortstop Carlos Correa flying the flag of the American League Pennant for a jubilant Houston crowd. Just weeks after the greatest test our city has ever faced, on a Saturday night no local sports fan will ever forget, and in front of what was doubtless the loudest crowd in Houston history, our magnificent, mighty Astros delivered a heart-stopping 4-0 victory over the New York Yankees in game 7 of the American League Championship Series last, earning a trip to the World Series for only the second time in the team’s 55-year history. On Tuesday, they will play the Los Angeles Dodgers in the first game of the Fall Classic. Starter Charlie Morton, along with Lance McCullers Jr, working in relief for the first time in his career, held the dangerous Yanks offense to just three hits, even as Houston’s bats dismantled New York’s vaunted pitching staff arm by arm. After a tense series of missed scoring opportunities early on, the Astros’ Evan Gattis, playing DH, launched a missile into the center field wall in the fourth inning, and the momentum only built from there. An inning later, when soon-to-be-MVP-if-there’s-a-God Jose Altuve stroked a homer to right well out of the reach of almost-but-not-quite-MVP Aaron Judge, you could feel the crowd start to believe. 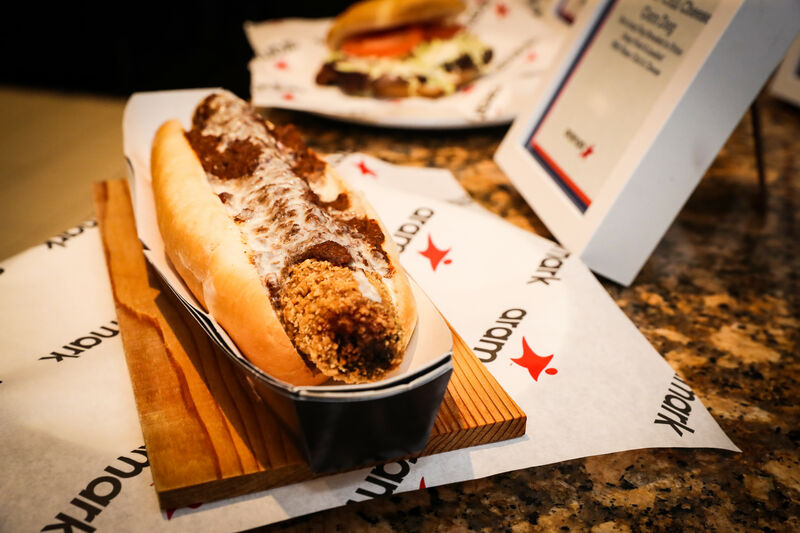 And later in the same inning, when shortstop Carlos Correa singled, first baseman Yuli Gurriel singled, and then catcher Brian McCann brought them both home with a rifle shot double to the right field corner—well, it was clear that the night was going to belong to Houston, indeed that the only way it wouldn’t be about Houston was if New York pried the night out of Houston’s cold dead hands, and dammit, that wasn’t happening either. 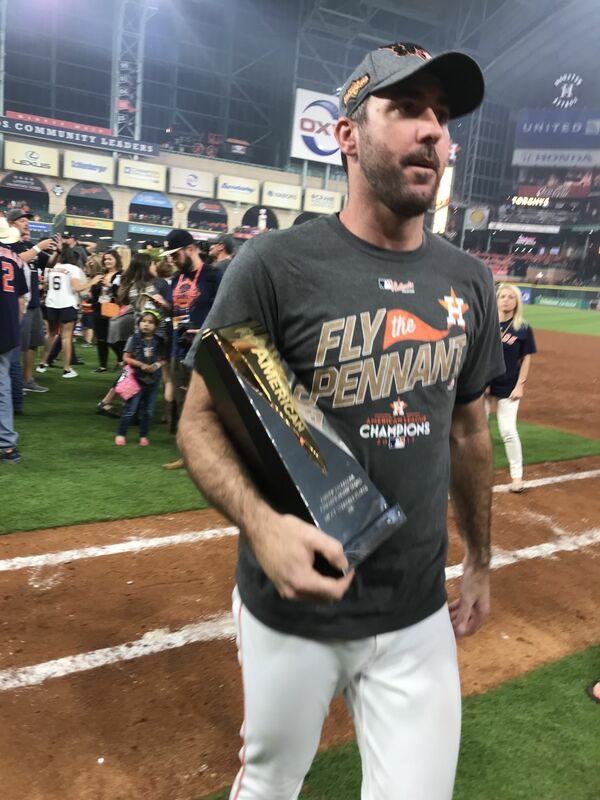 Justin Verlander was named the series MVP after two dominating pitching performances in games 2 and 6. 11 a.m.: Here's the only thing we can say for sure: October 24 is going to be a strange day in the city of Los Angeles. For one thing, it will likely be the hottest October 24 in Southern California history, with temperatures over 100 degrees expected. For another, Dodger Stadium will see its first Fall Classic game since 1988. But as strange as things already are, October 24 could get even stranger still. Depending on what happens a few hours from now, the Houston Astros may be in L.A. too, contending for a World Series title. What a strangely wonderful thing that would be. And that is the last thing we will say about October 24. 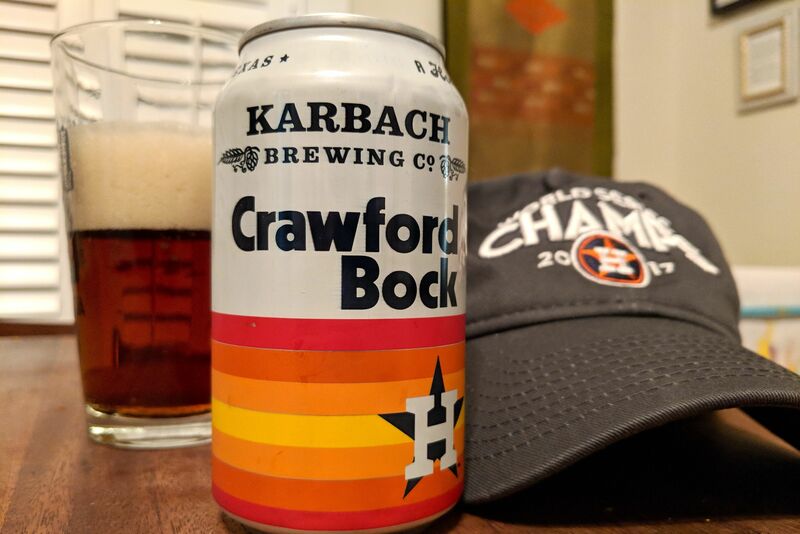 Not unlike many Astros fans, we are superstitious to the core, certain that any further mention of playing the Dodgers in the World Series will immediately and irrevocably jinx our boys out of contention. On the plus side, it isn’t hard to ignore such thoughts. 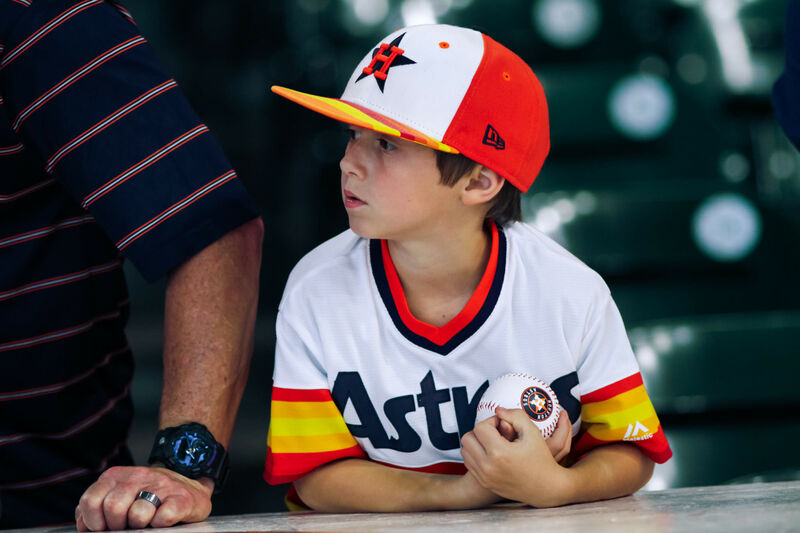 Having had our hopes dashed so many times in the past, it’s easier to imagine the Astros losing tonight than winning, which of course says more about the state of Houston fan-hood than it does about its baseball team. It also requires an interesting cognitive fallacy that almost all of us fall victim to from time to time. As tonight’s game approaches and its prognosticators throw it into high gear, telling you that the Astros always do this or X always happens to the Astros, and they know this because they’ve been watching the Astros for 40 years or whatever, free to ignore them. No one has been watching the Astros for 40 years. All they’ve done is spend 40 years watching 40 teams with the same name. Nothing that happened 40 years ago, or 20 years ago, has any bearing on what will happen tonight. Obviously. But the same also goes for what happened last night and earlier this week. The fact is, nothing that has ever happened to the Astros in the past can tell you with any certainty what will happen to the Astros tonight, which is both the most comforting and most terrifying thing in the world. 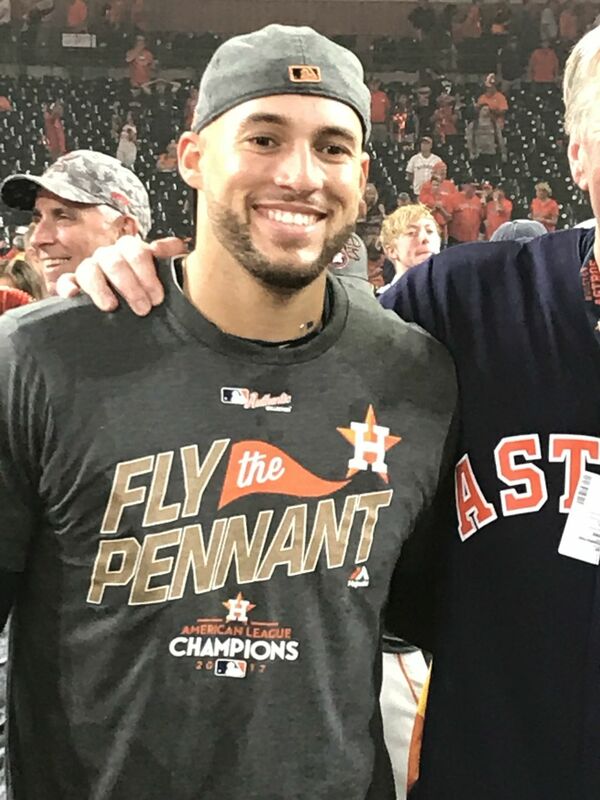 George Springer celebrates after the Astros clinched the American League Pennant. 6 p.m.: We're now just one hour from game time ...The 'Stros have completed batting practice and the Yankees are finishing up as well. More than an hour and a half before game time, fans have begun pouring in, with the Crawford boxes already completely packed. There's much talk among the press of manager A.J. Hinch's decision to move Josh Reddick from the second to the ninth spot in the batting order tonight. That's undoubtedly a reflection of Reddick's current hitting drought. (He hasn't had a hit in his last 21 at-bats.) The hope is that being in a less pressured spot might reignite the right fielder's bat, which, when Reddick's hot, can be among the most dangerous on the team. 6:30 p.m.: A few notes before we get under way. 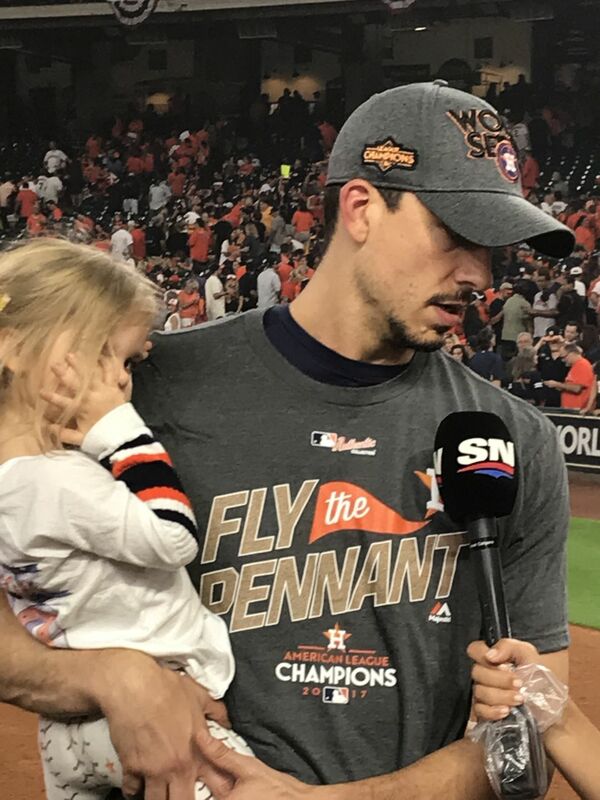 For all you folks wondering about Hinch’s choice to start Charlie Morton, who took the loss in game 3 of the series, a few things to keep in mind: During the 2017 season, no other pitcher in the American League had more wins at home than Morton (10). He also struck out 106 at Minute Maid this season (the fourth-most ever by an Astros pitcher) and performed superbly during the season’s second half. Remember too that if Morton should falter, A.J. Hinch will have his pick of every other pitcher on the team’s ALCS roster. Besides the Astros’ regular closers, there are Collin McHugh, Lance McCullers Jr and Brad Peacock to consider. Even Dallas Keuchel and last night’s starter Justin Verlander have been told to be available. It could be a wild night. Starting pitcher Charlie Morton gave a commanding performance during the early innings, setting the stage for a dramatic Astros victory. 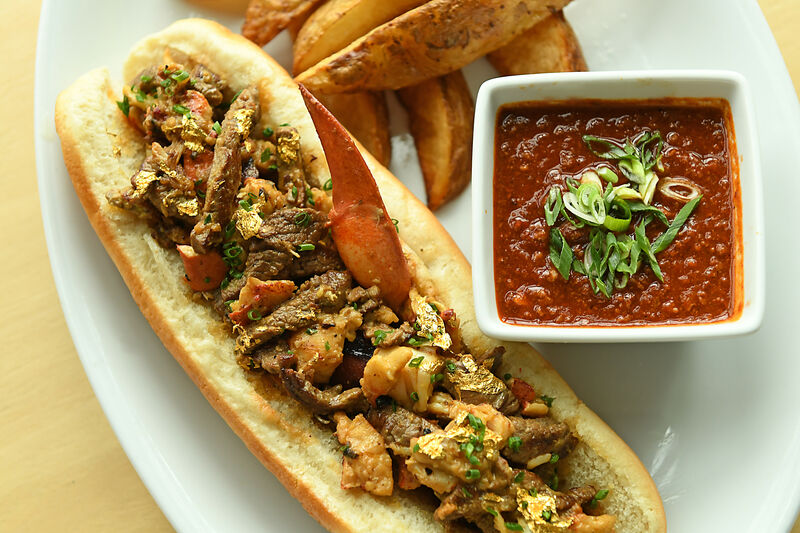 7 p.m.: Well, if this doesn’t get Josh Reddick’s bat going, we don’t know what will. As all diehard Reddick fans know, the slugger’s walk-up song (that inimitable combination of “wooooo” and Richard Strauss’s “Also Sprach Zarathustra”) is the same piece of music that used to welcome former WWE star Ric Flair into wrestling arenas. And wouldn’t you know it, the Astros have enlisted Flair himself to deliver the game's traditional “Play ball!” shout. 7:10 p.m.: Charlie Morton came out ready to throw smoke, immediately striking out Yankees left fielder Brett Gardner to thunderous cheers from the Minute Maid crowd. Right fielder Aaron Judge followed by grounding out to Alex Bregman at third base, bringing up shortstop Didi Gregorius, who struck out to end the inning. A quick and super 10-pitch inning for Morton. 7:20 p.m.: This night of nights began with a bang courtesy George Springer, who singled to center. Alex Bregman was next, who hit a slow bouncer that advanced Springer to second. Every fan in the park was on their feet when Jose Altuve stepped up to the plate next, but Altuve grounded out to third and Springer was forced to remain at second. The fourth batter of the inning, Astros shortstop Carlos Correa, also bounced out to end the inning. 7:30 p.m.: The Yankees got their first hit of the game courtesy catcher Gary Sanchez, who led off the 2nd. Next, first baseman Greg Bird flied out deep to Springer in center, bringing up the Yanks' second baseman, Starlin Castro. He grounded sharply to Bregman (who made a fine stop) and was safe on a fielder's choice, as the only play was to second. With two outs, the batter was center fielder Aaron Hicks, and he struck out to end the inning. 7:40 p.m.: 'Stros first baseman Yuli Gurriel led off the Astros half of the second inning and was robbed of a home run by 6'8" Aaron Judge, who leapt above the 7-foot-tall right field wall and netted it. That brought up tonight's designated hitter, Evan Gattis, and Gattis bounced out to the Yanks' third baseman Todd Frazier. Brian McCann the catcher followed, and he walked on four pitches. With two outs, up stepped left fielder Marwin Gonzalez, who singled to center just over the second baseman's glove. That brought up Reddick, who flied out to end the inning. 7:50 p.m.: Frazier led off the top of the third for the Yanks by flying out to Reddick in right center. Next, Altuve turned in yet another superlative play in this series, fielding a sharp grounder by the Yanks' DH Chase Headley deep and near the right field line before throwing him out at first. (The Yankees challenged but the call on the field stood.) With two outs, that brought up the top of the order and Gardner. He grounded out to Altuve to end the inning. 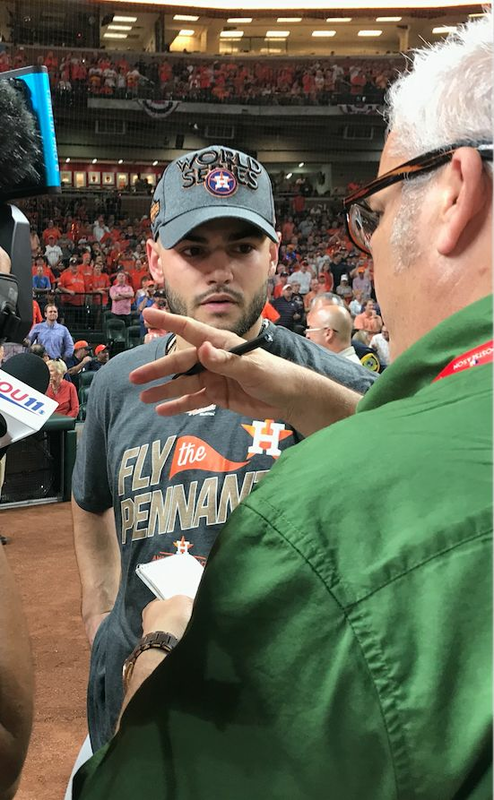 Pitcher Lance McCullers Jr, normally a starter, scored his first save on Saturday night, and it couldn't have come at a better time. 8 p.m.: The bottom of the third and the top of the Astros line-up, Springer. He ripped a ball sharply to the third baseman, who made a nice play to retire Springer. Bregman followed with another hard hit ball that Castro almost caught but it dropped out of his glove. That brought up Altuve, who walked. That brought up Correa with runners on first and second and one out. He hit a soft grounder and the shortstop's only play was to second. That put Bregman on third and Correa on first with two outs, but Gurriel grounded out to end the inning. 8:10 p.m.: Judge led off the top of the fourth for the Yanks by grounding out to Correa at short. Next, Gregorius struck out for the second time of the night. Sanchez, who'd singled his first time at bat, was the third batter of the inning. He lined out sharply to Carlos to end the inning. 8:25 p.m.: Gattis was first to the plate in the inning's bottom half. It was a beautiful at-bat that ended with a beautiful solo home run off a center field pillar! Astros 1, Yankees 0. That brought up McCann, who walked for the second time in the game. Gonzalez was the next batter and he grounded softly to short and was safe on a fielder's choice. That brought up Reddick with one out and Gonzalez on first. He singled to left and suddenly the slump was over. (Thanks, Ric Flair!) Yankees manager Joe Girardi elected to take Sabathia out of the game at that point, replacing him with right-hander Tommy Kahnle. The first batter he faced? George Springer, who grounded sharply into a double-play to end the inning. 8:35 p.m.: In the top of the fifth, Bird led it off for the Yanks by doubling to right. Castro was next to the plate with the tying run in scoring position, and he struck out. That brought up Hicks, who walked. (Astros reliever Will Harris began warming up in the bullpen.) A wild pitch also sent Bird to third. Frazier came next to the plate. He grounded to Bregman, who threw home, snagging Bird at the plate. That brought up the DH Headley with two outs, Hicks on second and Frazier on first. He grounded out to Altuve to end the inning. 9 p.m.: Leading off the bottom of the fifth was Bregman, and he flied out to center. That brought up Altuve again, and this time he sent one so deep to right field not even Aaron Judge could reach it. Home run Altuve!! Astros 2, Yankees 0. That brought up Correa, who singled to center on the very first pitch. Yuli Gurriel took Kahnle all the way to 3-2 before singling to right field, putting Correa on third. The next batter was Gattis, and with runners on first and third and still just one out, Evan struck out looking. That left things up to Brian McCann, and he exploded, driving a double deep into the right field corner that scored both Correa and Gurriel! Astros 4, Yankees 0. That was it for Kahnle, who was relieved by Yanks pitcher Adam Warren. He faced Gonzalez first, and Marwin grounded out to end the inning. 9:20 p.m.: The top of the sixth, a new inning and it was time for a new pitcher for the Astros. Proving that this wasn't just any old game, that pitcher turned out to the Lance McCullers Jr, who'd pitched well against the Yankees earlier in the series. In only his second relief appearance ever, McCullers faced Gardner first, and the left fielder singled to left. Judge was next, and he flied out in foul territory to Bregman. Gregorius was McCullers' third batter, and he struck out. With two outs and Gardner still on first, Sanchez came to the plate. He grounded out to Bregman to end the inning. 9:30 p.m.: Josh Reddick started things off in the bottom of the sixth by grounding out, bringing up Springer, who popped out in foul territory off the third base line. Then it was Bregman's turn, and he flied out to center to end the inning. 9:40 p.m.: The top of the seventh and the Astros were just 9 outs away from a World Series. McCullers was back on the mound, this time facing Bird, who hit a deep drive to center. Springer and Gonzalez both went for the ball, but Springer leaped up first and grabbed it for a spectacular catch that brought pandemonium to Minute Maid. Castro was next up with one out, and he struck out. That brought up Hicks, who grounded out to Gurriel to end the inning. Six more outs! 9:50 p.m.: Jose Altuve led off the bottom of the seventh, striking out for the new pitcher, the Yanks' David Robertson. Correa followed and cracked a single through the hole at short. Gurriel hit a soft grounder and was safe on a fielder's choice, which brought up Gattis, who flied out to end the inning. 10 p.m.: It was a cautiously optimistic Minute Maid crowd that greeted the top of eighth inning, but tension built again almost immediately after the Yanks' first batter, Frazier, walked on four pitches from McCullers. Headley was the next batter, and the DH struck out after a tense at-bat. Gardner flied out to Springer, and Judge stepped up to the plate with Frazier still on first and two outs. And when Judge struck out on four pitches, you could hear the cheers in Katy! 10:10 p.m.: A barely containable Minute Maid crowd, sensing a World Series trip within its grasp, greeted Brian McCann in the bottom of the eighth with a thunderous ovation. Facing Robertson, still on the mound, McCann struck out to bring up Gonzalez, who grounded out to the second baseman. Robertson next faced Reddick, who struck out to end the inning, bringing up what promised to be a raucous ninth inning such as Minute Maid had never seen. 10:20 p.m.: Three outs away, just three outs away, and the first batter McCullers faced was Gregorius, who struck out. Two outs away, just two outs away. Next up was Sanchez, who also struck out! One out away, just ONE OUT AWAY!!! The Yanks were down to their final out, and the batter was Bird. And when he flied out to center, there are no words, except maybe for these: THE ASTROS ARE GOING TO THE WORLD SERIES!